The thread companies seem to be making more and more fancy threads every year, but I am a beginner and am nervous about trying them on my quilts. Help! What changes do I need to make to my machine in order to be able to successfully use these threads? 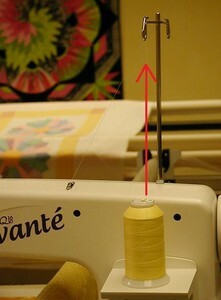 First, you will need to spend a few minutes adjusting the upper thread tension setting on your machine. Many of these threads are a little more fragile than what you might be accustomed to and will require a looser tension setting. Before you begin to stitch your quilt, make a small practice sandwich to see what sort of tension adjustments you will need. Some threads will require only a slight tweaking of the tension settings while some may require things to be dramatically looser, so it will definitely be time well spent to take a few minutes to experiment with your machine’s settings before you just charge ahead and start quilting. Next, you will want to give some thought to your bobbin thread. If you are using a slick and slippery top thread and you have a slick and slippery thread in the bobbin as well, you will have to pay extra attention to your stops and starts since those two slippery threads will want to untie themselves just as fast as they can. If you choose to use this thread combination, consider either hand-tying your stops and starts and burying the thread ends or taking 7 or 8 extra-tiny stitches at the beginning and end of each line of stitching to ensure that they are secure. To minimize this problem, try using a slightly ‘rough’ thread such as a 100% cotton or a cotton-wrapped polyester in the bobbin (I like Fil-Tec’s MagnaQuilt prewound bobbins for this) as the rougher bobbin thread will catch the slippery top thread and hold it more securely. If you are using a more fragile metallic thread on top, you will want to use a nice smooth thread in the bobbin to prevent the rough metallic and the rough cotton from catching on each other and yanking each other around (in this case, I prefer Fil-Tec’s MagnaGlide, or YLI’S Soft Touch in the bobbin). Now let’s look at how your thread is loaded. Quilters frequently fail to look at how the thread is being delivered from the spool and this failure can often lead to problems, especially when using specialty threads. Simply put, the way the thread is wound will tell you how to load it on your machine. 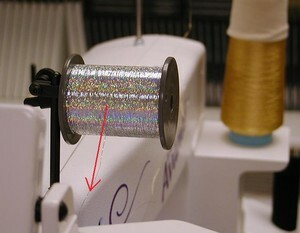 If the thread is on a spool it should be loaded on the machine so that it can unwind straight out from the side of the spool Photo A, as loading it any other way can cause it to twist and turn on its way from the spool to the needle, causing knots and breakage. Next up: needle size. 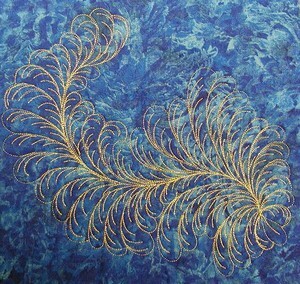 When quilting with specialty threads, all needles are not created equal! If you’re having trouble with shredding or breakage as you quilt, try going up one needle size so that the needle will punch a bigger hole in your fabric, making it easier for your thread to pass through the fabric. For years I have routinely used a size MR4 needle (equivalent to a size 18) and have had excellent luck in virtually eliminating shredding and breakage. Keep in mind that a needle this size would be overkill when using a very thin thread such as silk or fine monofilament and in those situations you can usually get away with an MR3 or 3.5 (size 14 or 16). Remember that the thread passes through the eye of the needle many times before it is finally formed into a stitch, so not only do you need to make sure that the hole in the fabric is easy for the thread to pass through, but the hole in the needle itself needs to be big enough for the thread to slip through with minimal friction. Another thing you’ll want to carefully consider is your stitch length. 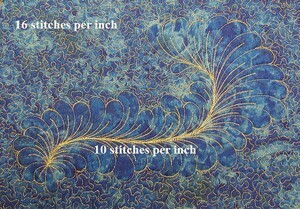 The longer the length of the stitches, the more the beauty of your thread will be highlighted. For example, if you are running a gorgeous variegated thread you will definitely want to decrease your stitch length to approximately 10 spi so that you can more easily see those lovely colors flowing into each other. In this case, a short stitch length would make it harder to see those color variations and the thread would be less effective. Lengthening or shortening stitch length is a useful trick to use to give yourself quite a bit of control over the finished look of your quilt. For example, if you are using a metallic thread, a longer stitch length will give you more sparkle, while shorter stitches will still allow your thread to sparkle, but to a lesser extent. If you look at PHOTO D you will see that I used 10 spi when stitching out the feathers so that they would be very sparkly and eye-catching. However, if the surrounding stippling had also been stitched at 10 spi, the effect would have been overwhelming, so I shortened my stitch length to cut down on the sparkle and go for some subtler twinkle instead. 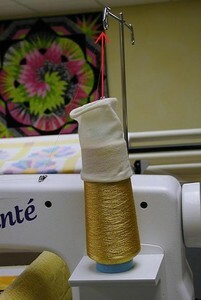 This trick works like a charm when you want just a little bling but not so much that you overwhelm the quilt. Speaking of overwhelming the quilt, be sure to plan carefully when using these showy threads. If you’re not careful, your quilt can turn mighty thready mighty fast. Think about how this thread is going to look if it’s stitched out heavily. Will it compliment your quilt, or take it over? If you compare photos D and E, you will see that Photo E is really too much thread. Putting multiple eyelashes in each and every feather very quickly grew to be somewhat alarming. Putting only one vein in each feather and surrounding the feathers with twinkly stippling was a much better choice with this beautiful bling-y thread. You’ll definitely want to watch your speed when stitching with these threads. Stitching like a wild woman will cause your needle to overheat and will also increase the likelihood that your thread will tangle, knot, and break, especially when using one of the more fragile threads. Slow it down a bit, particularly if you are stitching a design that requires frequent changes in direction. Give your machine time to fully form the stitch before suddenly heading off on a new path, or you will run the risk of increased shredding and breakage along with the accompanying frustration. Be sure to try different brands to see what works for you. For example, not every metallic thread will work for every quilter and just because Brand A does not work for you that doesn’t mean that Brand B won’t work either. Remember the old saying; If at first you don’t succeed, go buy more thread! Be willing to try a couple of different brands and you’ll find one that runs like a champ in your machine. And don’t forget that if a thread doesn’t work on top, you can always put it in the bobbin and do some beautiful bobbin work!